February Report: Can Blogging Be Profitable? As you may already know, last month I started a new blog project over at viciousfoodie.com. The idea behind it was two-fold: First, it was just something fun I wanted to do. I love food. I love Europe. And I’m a big ‘ol snob about it. So a food blog about Europe felt like a perfect fit. Second, I wanted to do an experiment to see if starting a blog these days is still potentially a way to make a living. People ask me about blogging all the time and I usually tell them there are much easier (and much quicker) ways to make money. But with the marketing and blogging skills I already have after 20 years in the business, I wondered, can I start a blog and turn it into income within the span of a year? And so the blog was born. And so, too, was this series of posts born. Every month, I’ll check in and let you know what exactly I did over on that blog and why. I’ll give you real stats on my visitors. I’ll tell you what it cost me. And I’ll tell you if or when it starts making money. So, interested in knowing more? Let’s dive into February. My goal this month was to get at least four links back to my site, so I started very casually searching out opportunities to guest post/contribute on relevant sites. First, I asked a very successful blogger friend if she had any suggestions, and she suggested I write something for her site (great news for me because her site has a high domain authority, which means Google trusts her and by linking to my site, she passes some of that trust along to me). Second, I joined some blogging Facebook groups and started reaching out to people who were asking for guest posts. In the end, I submitted 15 guest posts to 15 different places and about 6 posted before the end of the month. Since link-building is my number one priority now, I started brainstorming alternate ways to go about it. Guest posting is great and effective, but what else could I do to get relevant sites linking to mine? One of the ideas that came to mind was providing my photos for free use (through Creative Commons) on blogs and websites in exchange for a do-follow link back to my blog. Will it work? Only time will tell. But I did spend some time on it in February. First, I created an album on Flickr called FREE food photos! I went through all my food photos and chose the best of the lot (249 of them) to add to the album. Then I changed the settings on those photos so that they could be found in a Creative Commons search on Flickr. And then came the hard part: going through each of the 249 photos individually to make them searchable. You see, when I first uploaded them, I wasn’t particularly interested in them showing up well in Flickr searches. I use Flickr as a backup where I store photos and as a place where I can quickly and easily re-size and use photos on my blogs. I didn’t need the photos to be searchable on the platform, so when I uploaded them in batches, I gave them batch names. This meant all my photos from Bologna just say Bologna and all my photos from Switzerland just say the name of the town and city. Now that I want people using the photos on their sites and linking back to me, I need to create better titles, descriptions, and tags. And so I sat down one morning in between client projects and went through one by one. While doing this, I also changed the URL people have to link to on some of the posts. Generically, they all started with viciousfoodie.com. But when I came across photos from Brittany, I changed the link to point toward my Brittany posts. When I edited photos from Paris, I pointed toward a Paris post. 1. I want readers to feel like the site is substantial and active when they stop by. 2. I want search engines to see that the site is substantial and active. 3. Part of SEO success is cross-linking (the act of linking relevant pages and posts on your site to each other). This helps Google (and readers) get to related content easily and understand your niches. If I post 10 posts about different aspects or types of cheese and cross-link them to each other, it starts to feel like my site is about cheese. If I post 10 posts related to eating in Italy and cross-link them, Google (and readers) get a sense that I have some expertise in and passion for Italian cuisine. My goal is to build expertise around Switzerland, France, Italy, and Slovenia primarily. I’ll cover other parts of Europe as I visit them, but those are the countries I find myself drawn back to again and again, which means I’ve spent more time in them, I know more about them, and I’ve eaten more great meals there. With that as my goal, I’m batching posts so that they mostly focus on those countries and so that I very quickly can start linking between them. 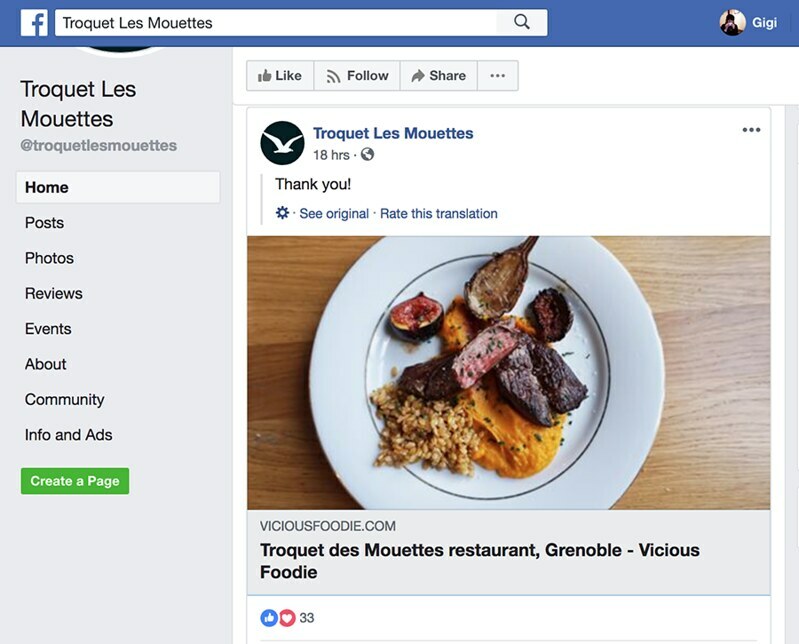 For example: In month one, when I decided to post a review of my favorite restaurant in Grenoble, I quickly also posted a review of my second favorite restaurant in Grenoble and linked the two into each other. Then I started brainstorming what other content I could write that would build on those articles. Could I post about dog-friendly restaurants in Grenoble? Did I have enough recommendations to do a round-up of best restaurants in Grenoble? Were there any Grenoble specialties I could write about in the near future? And so with every piece of content I know I want to publish, more ideas bloom outward. Final caveat: If you publish too much content too quickly, Google might flag you. Nobody’s been able to define “too much” for me, but I’m guessing that means multiple posts per day, so I think I should be okay with 2 – 4 per week. When I think about what content to write and what order to publish it in, there are a number of things I consider. Is it content likely to rank well in search engines? Is it sharable on social media? Is it content I can link to when I guest post on other sites? Is it content that will earn me affiliate sales? La Ferme à Dédé restaurant, Grenoble: This is my second favorite restaurant in Grenoble. I published this review in January because I had already decided to publish a review of my favorite restaurant and I wanted a quick way to cross-link and have multiple pieces of content on the site related to Grenoble, France. Where to eat in Assisi: Osteria Piazzetta delle Erbe: This is one of my favorite restaurants in Italy, so I decided to lead with this review for my Italy content. Troquet des Mouettes restaurant, Grenoble: This is my favorite restaurant in Grenoble. I wanted to lead with a few of my favorite spots and this one made the cut. La Fleur de Sel: an excellent Dinan restaurant: Speaking of leading with my favorite spots, this is another one. This time the location is the region of Brittany, France (and so you’ll see lots of other Brittany content in the queue very quickly). Villino di Porporano: the perfect bed and breakfast in Parma, Italy: Another absolute favorite foodie experience, I led with this just because I love it. Farmers markets in Prague: the good, the bad, and the WTF: This one is a bit of an outlier. I’m not particularly focused on Czechia and it wasn’t one of my early goal countries, but I felt like the fact that I had a WTF reaction to one of Prague’s fresh markets was a good opportunity for me to play with the snarkier/more particular voice I want this blog to have. Everything else was a rave review. This was my chance to mix in some snark with the positivity. 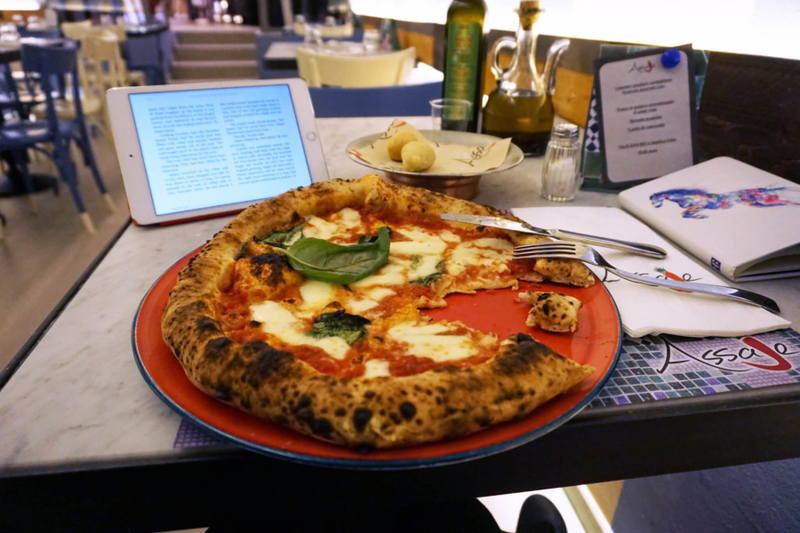 The Michelin guide keeps failing me (or why I started this blog): This post was another opportunity to play with the more particular/snarky side of the blog voice and to explain the frustration that led me to this project. Frenchie Bar à Vins, Paris: Let’s be honest. 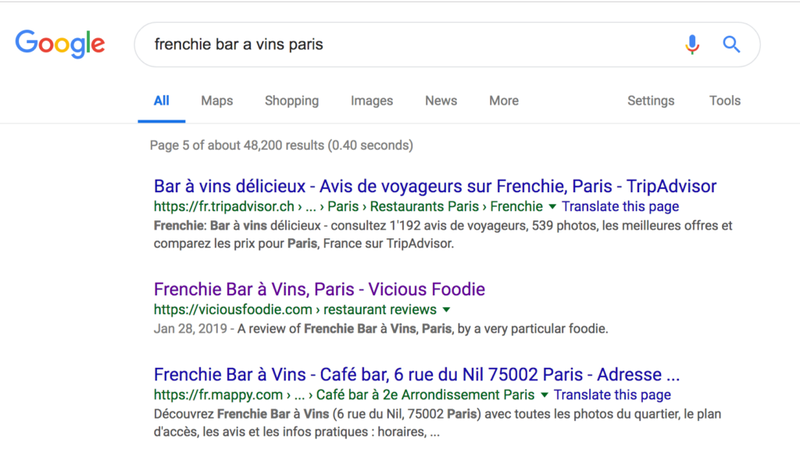 I’m probably not going to be ranking for Paris keywords on Google anytime soon. They’re too high value and high competition. Which is why normally I’d probably save the Paris restaurant reviews until a little later. That said, my first guest post opportunity is a post about Paris on a very high value blog. Since I’ll be writing about Paris there, I wanted to make sure I had some solid Paris content at Vicious Foodie, both so that readers would click through and get the payoff they expected (content about Paris) and so that search engines following links from a Paris article would find my site relevant. Restaurant Philippe Excoffier, Paris, 7th arrondissement: Same reasoning as above. An in-home cooking class in Rennes: To build on my Dinan restaurant review, I started posting more content about the region (Brittany) and cross-linking said content. What to eat in Switzerland: 9 must-try dishes according to Chef Andreas Caminada of Schloss Schauenstein: To start building my Switzerland content (and start publishing chef interview pieces), I kicked off February with this post. Where to eat in Switzerland: 5 of top chef Andreas Caminada’s favorite restaurants: Because the chef interview was so robust, I split the post into two to focus on two different sets of keywords for Google searches. In the first (above), we’re talking about what to eat in Switzerland/Swiss dishes. In this piece, I talk about where to eat in Switzerland. This was a logical breaking point in the interview and it created two substantial pieces of content to cross link. The farmers market in Bern, Switzerland: Continuing to build my Switzerland content, I decided to feature a farmers market I like. Brittany food guide: what to eat while traveling Bretagne: This is another SEO-driven piece. Since I have so much to say about Brittany, I used Keysearch and Answer the Public to figure out what kinds of questions people are asking about the region that I might be able to answer. This topic felt like a great fit and so I pushed it to the top of my list. Boulangerie in Rennes: Boulangerie Pâtisserie Coupel: Another piece of content about Brittany, I published this for cross-linking. And it should go without saying that literally every review here really is my favorite, so it wasn’t a question of coming up with more places to review in each place. It was always a question of which of my favorite places to prioritize. Since I have a lot of Brittany favorites, it made sense to prioritize them in succession. Mariage Frères tea rooms in Paris: Like the Paris reviews above, this became a priority because of the upcoming guest post and so that I can cross-link more than a couple pieces of Paris content. Grand Hotel de l’Abbaye in Beaugency, France: breakfast made by monks and nuns: I’d like to have a second B&B up and this felt appropriate for Valentine’s week since it’s darling and romantic. Plus, more France content to cross-link! A year of foodie challenges starts now: For the rest of the year, I’ll be taking on a food challenge every month. Firstly, just because it’s fun and encourages me to try new things and do more with the food blog. Secondly, I thought this would be the kind of content other people can join in with, which will help user engagement on the blog. Thirdly, I think food challenges are very sharable, so this content could turn into a social media gem for me. We’ll see. Marché de Lices: Rennes market: Another piece of Brittany content, this was prioritized for cross-linking. What is fleur de sel? : This post is all about SEO. I used Answer the Public to find out what questions people Google about fleur de sel–a salt harvested in Brittany, France–and created a piece of content around those questions. In addition to being written with SEO in mind, this piece is perfect for cross-linking since I’ve already started writing about Brittany, France. Everything you need to know about Swiss cheeses: an interview with a Master of Cheese: I already had this interview from my Switzerland guide, and since I’m prioritizing Swiss content, it felt like low-hanging fruit to re-hash the interview and publish on the blog. Central market, Ljubljana: fresh ingredients in the city center: One of my upcoming guest posts is about my favorite fresh markets, so at the end of the month I published posts about several of them so that I could link into those posts from my guest piece. Annecy market: fresh food at Old Town Market: Same as above. Grenoble farmers market: Same as above. March food challenge: learn to take better food photos: The next month of my food challenge is almost here. Just in case others have decided to join me, I’m publishing the March challenge just before March begins. The foodie challenges are designed both to encourage me to do fun new foodie things and also to generate interest and engagement with my target audience. Securing your site with SSL makes it secure if you’re processing customer data, selling things, etc. Since I don’t collect sensitive data on either of my sites, I hadn’t taken the time to update them to SSL. And then, early this year, someone pointed out that SSL also helps your Google rankings. So I made some time in early February to update both my sites. At first, I was really nervous about it because when I asked about it in my blogger groups on Facebook, everyone said I should hire someone and it’s really difficult to do and there are lots of ways in which things can do wrong. With all that in mind, I chose a time of day when people were unlikely to be on the site (extreme early morning US time; early afternoon for me) and went through the process. Luckily, it turned out to be rather uncomplicated (and free) through my website host, NameCheap. It was a two-step process for each site and took approximately 20 minutes (half that time was just waiting, which meant I could spend it doing other things) to get it set up. With this site, I did hit one snag: after I went through the process, the site content looked wonky. I reached out to support and they gave me a quick fix. It was back up and running in about five minutes, looking right again. I also used Google Search Console to verify my new site with Google and submit a site map in the hopes that they’ll index me and start showing my content in search results soon. A few days later, I checked to see if I was indexed (by Googling my blog name) and I have been! Now it’s just about building up links and SEO content and working toward actually ranking for things. Domain authority is how Google (and other search engines) decide how reliable your website is, and it’s one of the factors that goes into ranking for keywords in search engines. There are a number of ways to build up your authority, but the biggest one is probably links (which I talked about above). Getting links, and particularly getting links from other sites with high domain authority, improves your own. Other factors include social shares (so every time you share a post from Vicious Foodie or this blog, you’re helping me build my authority), SEO, quality content, and linking to external relevant sites (which is seen as helpful). As I work on my SEO, content, and link-building, I’m also going to be monitoring my domain authority (at this point, mostly out of curiosity). Currently, it’s a 10 (that’s out of 100, so it’s still very low). $0. Right now I’m spending time rather than money. 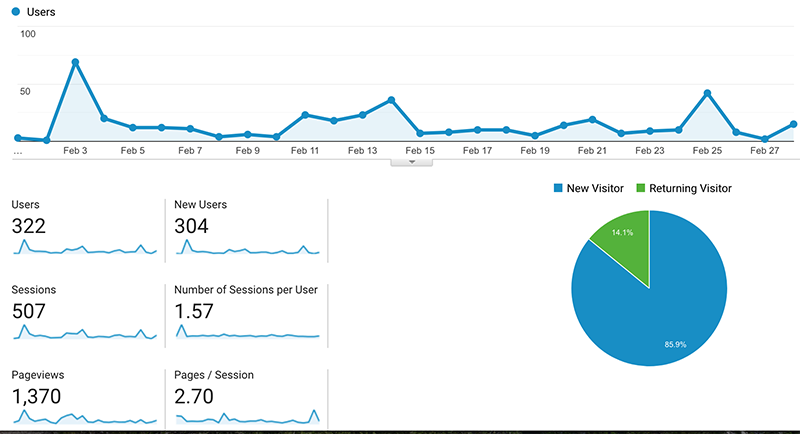 In early February, I noticed a tiny spike in traffic. I hadn’t guest posted anywhere yet and I wasn’t doing any promotion, so I went digging to see what happened. Had someone else linked to me? Had Google discovered me? I turned to Google Analytics for answers, clicking into the Acquisition tab and filtered by the day of the spike to see where the traffic was coming from. The answer was Facebook. The interesting thing was that I hadn’t posted on Facebook over the weekend. So someone else must have. I was curious who’d picked me up, so I dug a little deeper. Above the list of social networks, I chose the Second Dimension drop-down and found “Destination Page,” which tells me which page is getting all this new traffic (which might give me a hint as to who was sharing it). Turns out the answer was my review of Troquet les Mouettes, which gave me the ah-ha moment I was looking for. Over the weekend, I’d messaged the restaurant on Facebook to ask if the chef would give me an interview. I also pointed them toward the review on the blog. And they were thrilled, so they posted it on their Facebook page. Now, obviously that’s still not tons of traffic, but I share the process here in case it’s helpful in your own sleuthing. This is the kind of process I go through to try and keep track of what’s happening, understand how the site is doing, and learn what’s working. What I learned here is that later this month I need to message the places I’ve reviewed already to give them a heads up. Who knows how many will decide to link on their websites or social channels? At the end of the month, I checked my stats again and I’m very happy with where things are. From month one, I’ve quadrupled my small readership. Am I Ranking in Google Yet? I spent some time late in the month Googling phrases I thought I might rank for. Since my domain authority (DA) is still rather low and my site is so very new, I didn’t expect to show up very high in search results yet, but was pleasantly surprised to find that I am showing up. This month, I’ve been focused on building content, links, and SEO value and I haven’t done much to monetize yet, so it’s no surprise that the number is $0. Right now, the work I’m doing is foundational. But I’ll start attempting to monetize soon. I want these reports to be as detailed, interesting, and helpful as possible, so let me know if there’s something else you’d like to know or something I can do to improve them! Like this post? Get future posts by email or rss. Wow, 15 guest posts in a month? That’s pretty intense! Did you worry about each of their domain authorities? I’ve had trouble finding people in my niche to collaborate with. Do you have any tips? This is really helpful–thanks Gigi! I was pretty relaxed about DA at first (though I think they were all between 20 and 50). Now that I have a longish list of guest post opportunities, I’ve started turning down lower DA options. I’ve had really good luck finding guest post opportunities and collaborations through relevant Facebook groups, so my suggestion would be to spend some time browsing FB groups in your niches and seeing if there are any for marketing/collaborations/bloggers/etc. Thanks! Good luck–looking forward to further updates. Interesting new blog. You sound like me in the fresh markets! ha Hope this will be a success for you. Hi there. I'm Gigi—a location-independent writer traveling the world with my pint-sized pooch, Luna, and my partner, Chad. I believe in slow travel, risk-taking, and living life on your own terms even when it's hard. Love that idea? Get new blog posts in your email twice a week. Oh, and let's be Facebook friends, shall we? (+ I'll send you a FREE copy of Europe: An Incomplete Guide). Copyright © Gigi Griffis. All Rights Reserved.